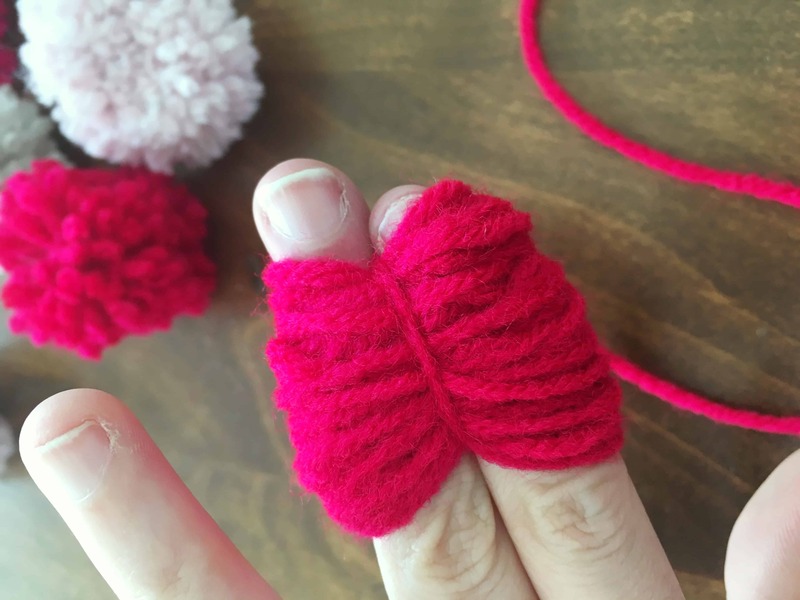 I recently discovered how to make Pom-Poms out of yarn. 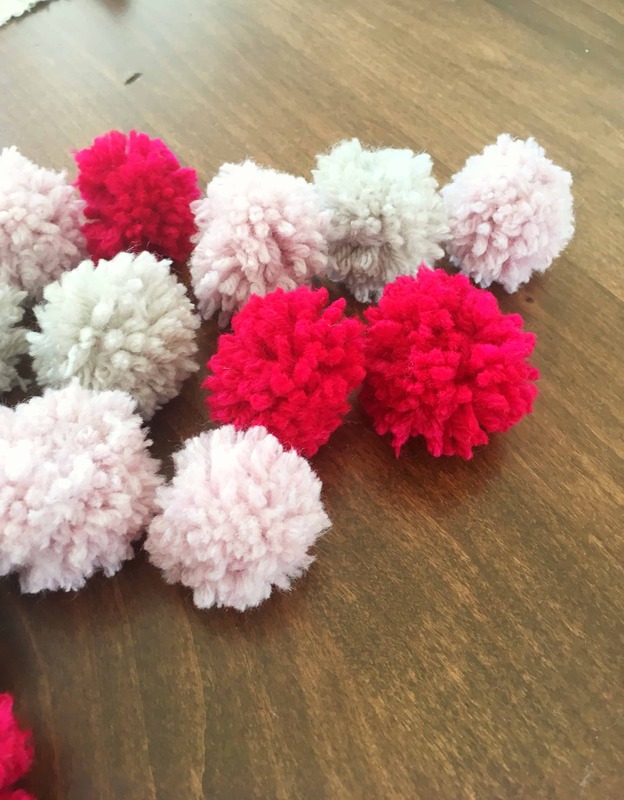 These pom-poms turned out to be incredibly easy to make and so addicting! 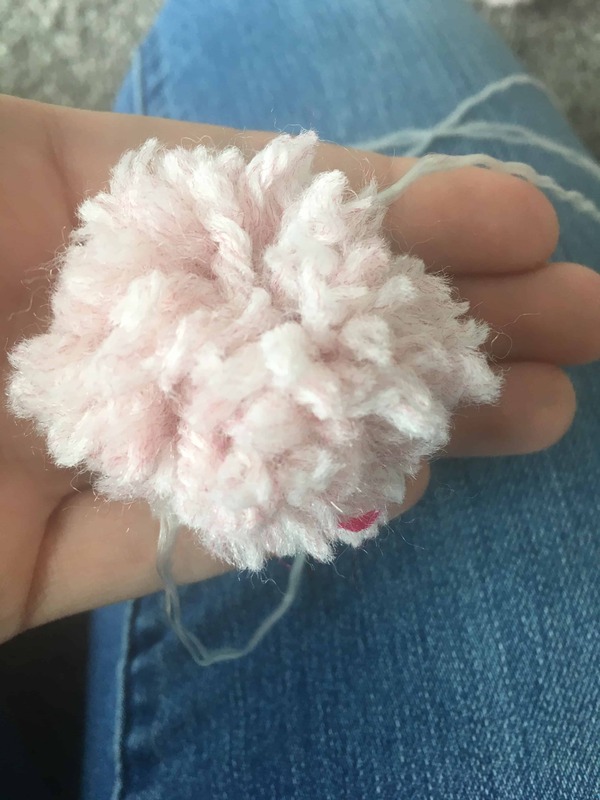 My daughters and I spent all evening making pom poms and experimenting with different sizes and techniques. 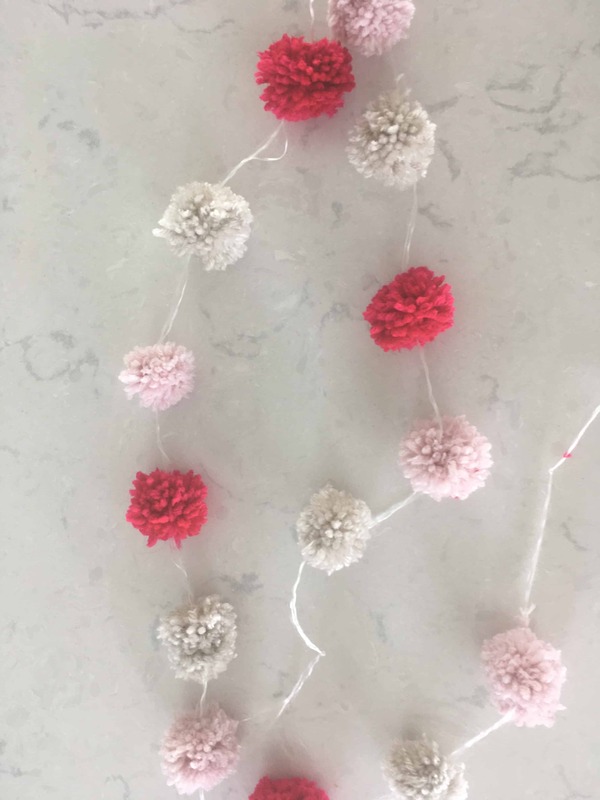 We decided to turn these yarn pom poms into a cute garland for Valentines Day. I love how it turned out and am already planning more garlands in other themes and colors! 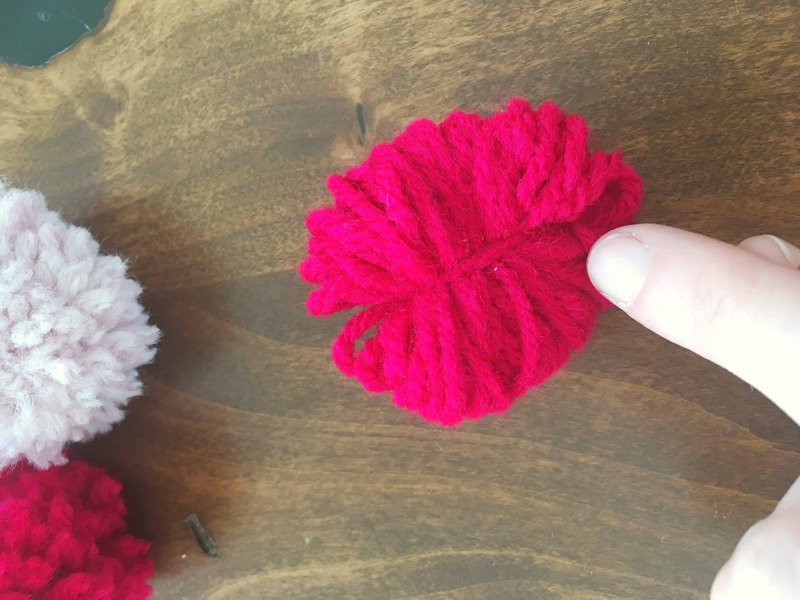 These were so fun to make, I thought I would share an easy tutorial with all of you! I was able to use items I already had at home and didn’t need to spend any money (yay! 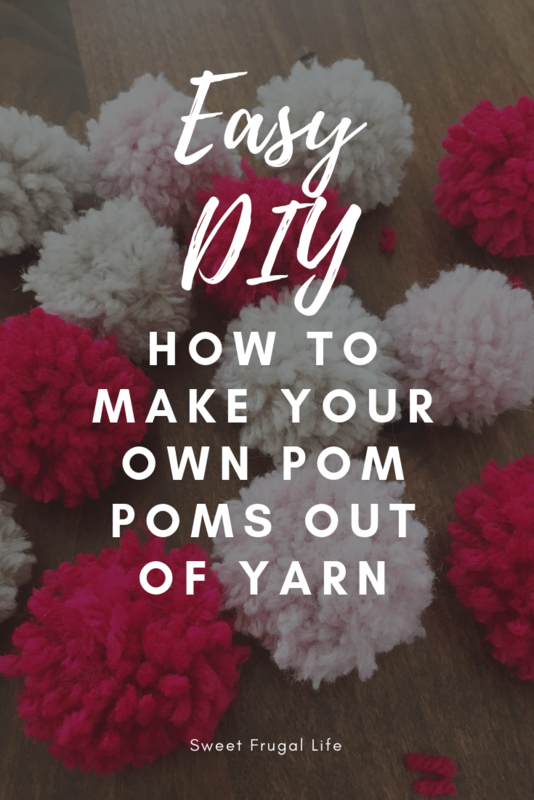 ), but you can find some quality yarn for less than five dollars and it will make hundreds of pom-poms! I linked one of my favorite yarn brands on Amazon here. 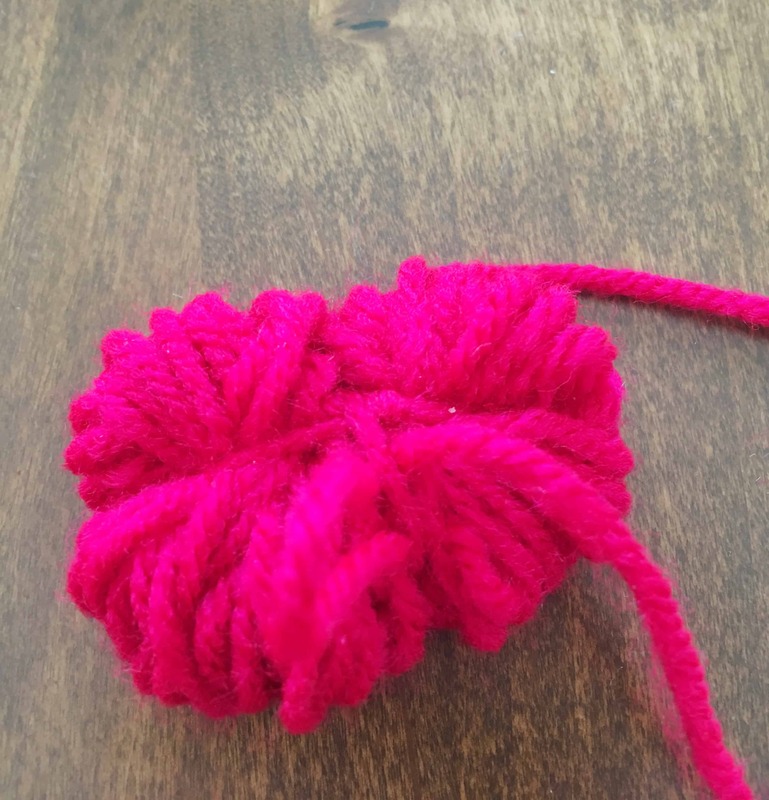 Take a small string of yarn (the softer yarns seem to work best!) and begin wrapping it around two of your fingers. Keep wrapping until the yarn looks a good size. I just eyeballed it, but I probably twisted the yarn about 70-100 times. 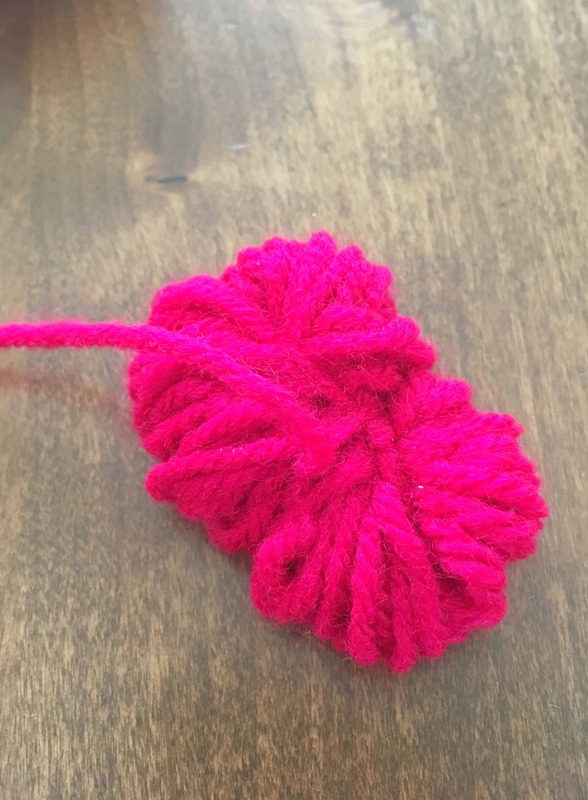 When the pom-pom looks right, cut the yarn leaving about 6 inches of a tail. You will then push the tail through your two fingers and pull it out the other side. 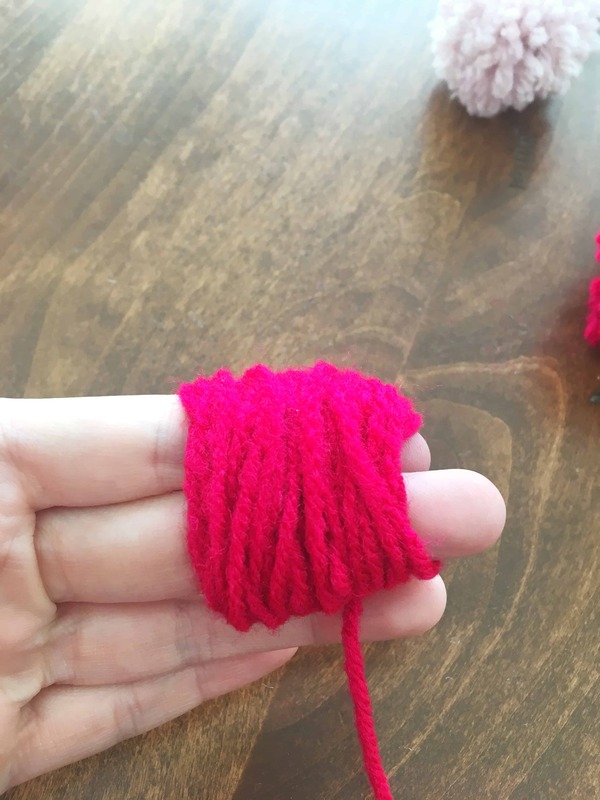 Bring the tail up on top of the yarn and push it through the top of your two fingers. Pull it tight. 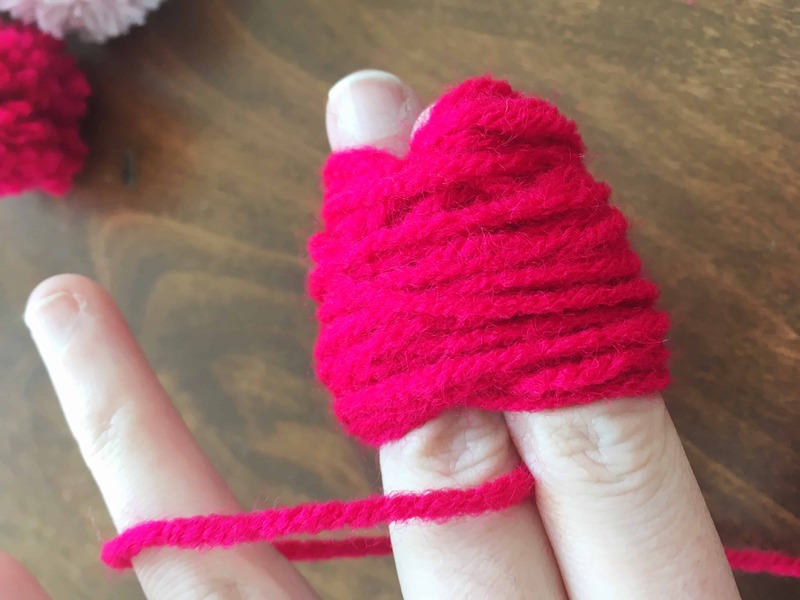 Now, gently slide the yarn off of your fingers, making sure to keep the yarn pulled tight and kept across the middle. Knot the tail and wrap the remaining tail across the other middle, this will form a plus sign. Pull it tight and knot it. This will form four sections. Tie another knot securing the yarn. Next, you will need to grab some sharp scissors. I used my fabric scissors (aka: “if anyone uses these for anything other than fabric they will be in HUGE trouble” scissors). Begin cutting the loops apart in each section. Make sure you do not cut the tied tail. We only had this happened once, but it’s important to remember. Continue cutting all of the loops. Once finished, it will not look very good and you’ll wonder if you did it right! You did. 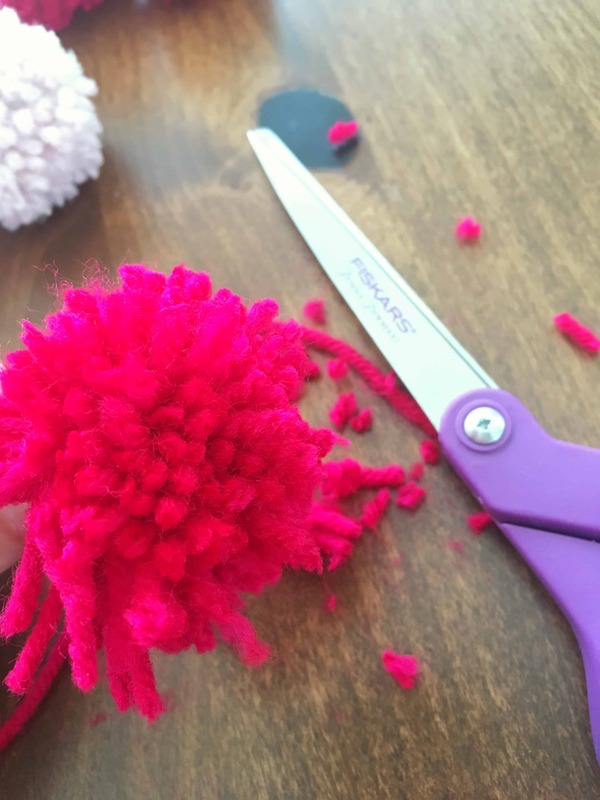 The pom pom just needs some fluffing. Shake it, separate the pieces and try to fluff it out as best as you can. Once your little ball of yarn is all fluffed out it’s time for a haircut! 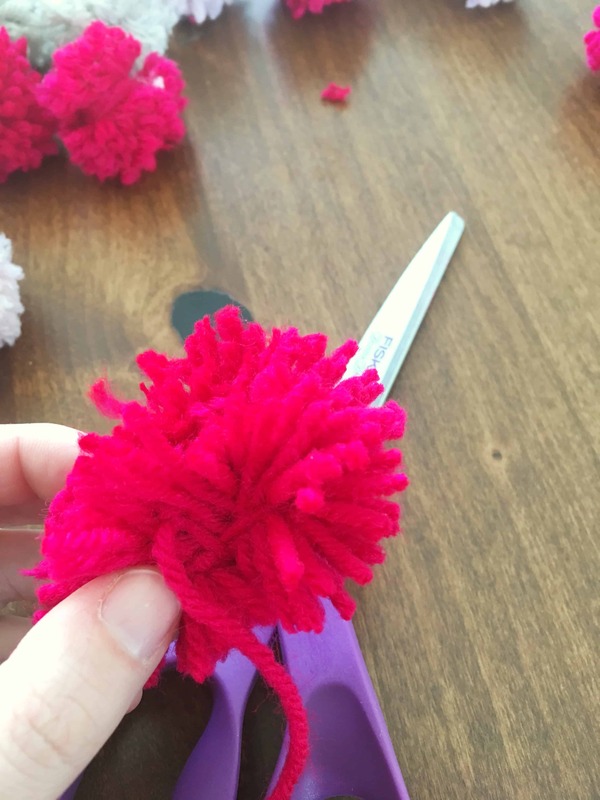 This is when you will see your pom pom begin to take shape. 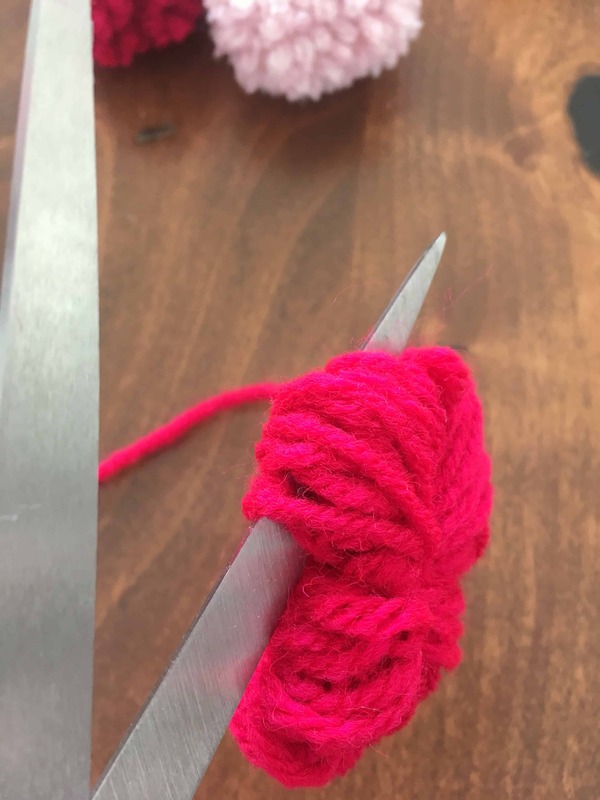 Trim the yarn pieces until they are all even. I also like to cut them fairly short, but not to short. Play around with it a little bit and you will find the style you like. My daughters kept theirs a little more long, it’s all personal preference. That’s it! 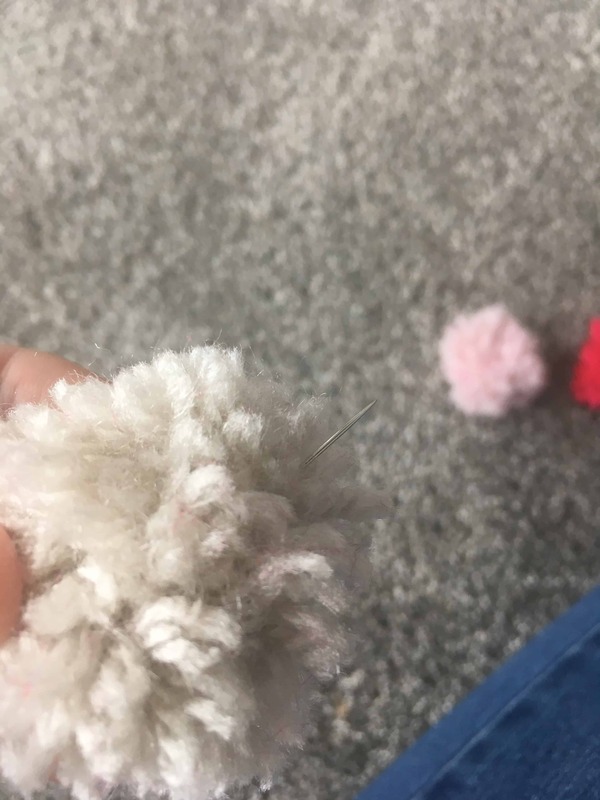 Your pom pom is done! Isn’t it cute???? The first one takes the longest…..to be honest, I threw away my first five. But, once I had a little practice I was able to whip them up much quicker. Stick some googly eyes on those pom poms and make little monsters for your kids, OR you can string it together to form a cute garland. I chose the garland. After browsing through my house unable to find a string for my garland I resorted to the garage (I was refusing to spend money on this project!). I found some string in mu husbands stash of “stuff” and it worked really well. I have also heard that twine or even embroidery thread would work for garland. Tie a knot at the end of your string and use the string to thread a needle. 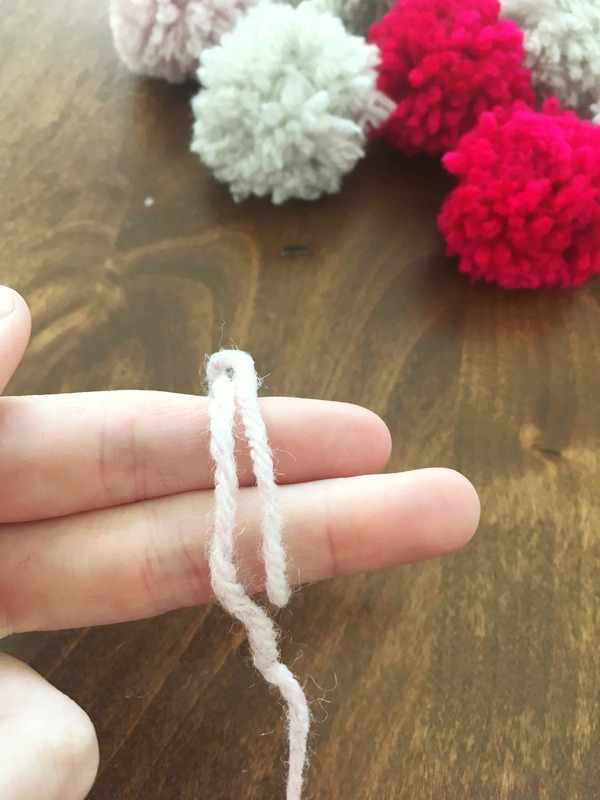 You will then stick your needle right through the middle of your pom-pom, pull it along the string until it reaches the knot, and continue until your garland is at the desired length. 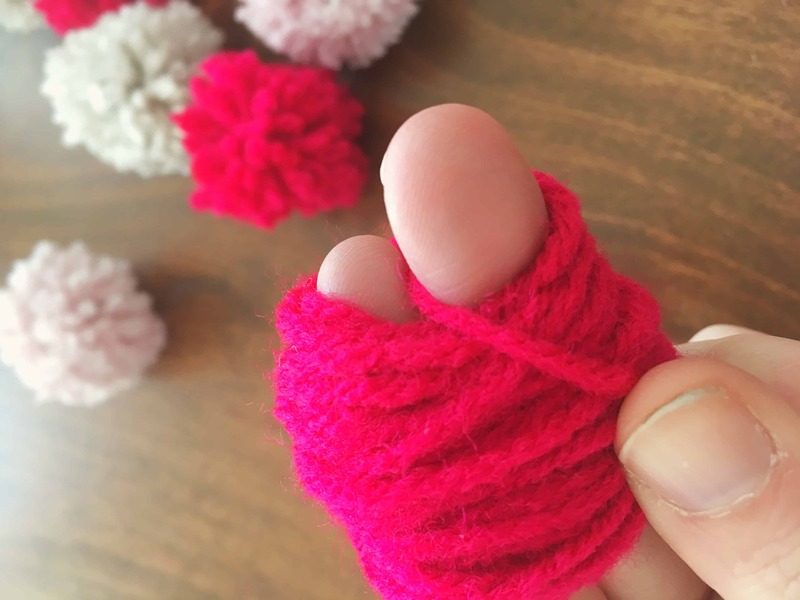 Knot off the end and you are done! 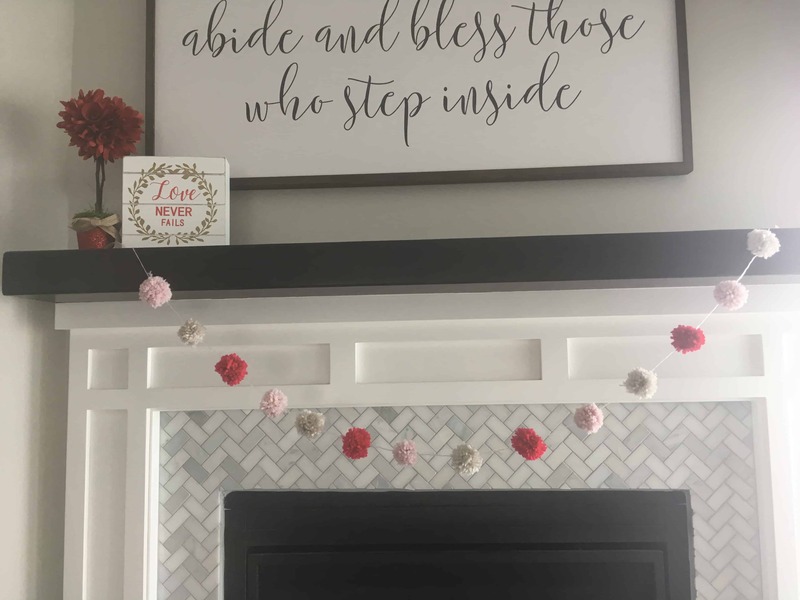 You can hang your yarn pom-pom garland around your house, but we came up with a different idea. 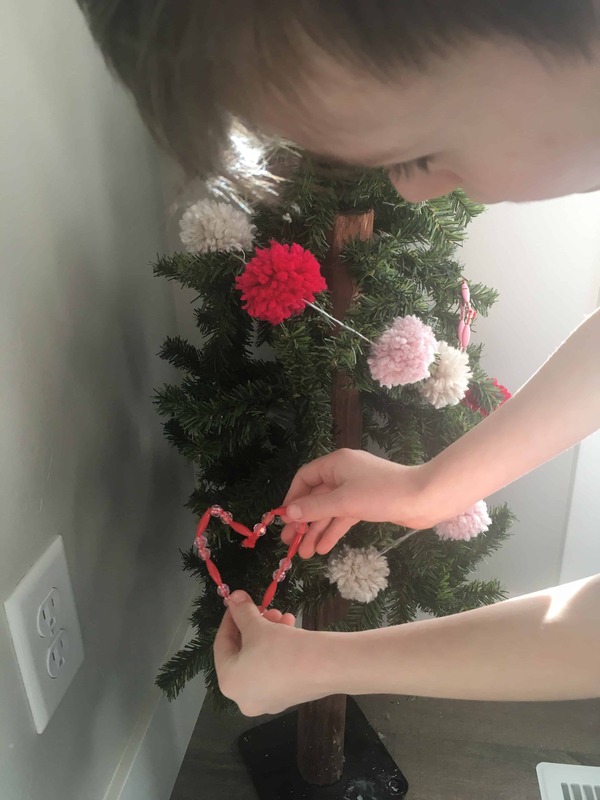 We decided to decorate one of our little Christmas Trees as a “valentine tree.” We have been making little crafts for it all month and decided this garland would be the perfect addition! 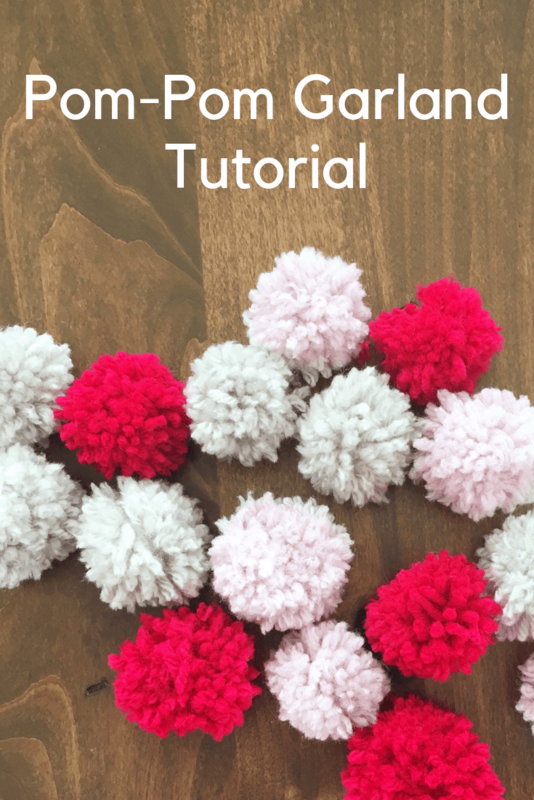 Let me know if you make a pom pom garland! I would love to hear how it went.